The record is made up of 46 folios. It was created in 1874. It was written in English. The original is part of the British Library: India Office The department of the British Government to which the Government of India reported between 1858 and 1947. The successor to the Court of Directors. Records and Private Papers. muscat political agency An office of the British Government and, earlier, of the East India Company. for 1873-74.
of Muscat during 12 months, 1873-74. Class A. —European and American. Persian Gulf Historically used by the British to refer to the sea area between the Arabian Peninsula and Iran. Often referred to as The Gulf or the Arabian Gulf. H. B. M.'s Acting Poltl. Agent and Consul, Muscat. Report on the Administration of the Bushire Residency A diplomatic office of the British Government established in the provinces and regions considered part of, or under the influence of, British India. including that of the Muscat Political Agency An office of the British Government and, earlier, of the East India Company. , with Reports on Trade for 1873-74 , printed at the Foreign Department Press, Calcutta, 1874. The report is split into two sections and further into subsections. The first section relates to the Residency A diplomatic office of the British Government established in the provinces and regions considered part of, or under the influence of, British India. at Bushire, the second to the Political Agency An office of the British Government and, earlier, of the East India Company. at Muscat. Twenty-four tables of trade statistics (A-X) (folios 9-38). 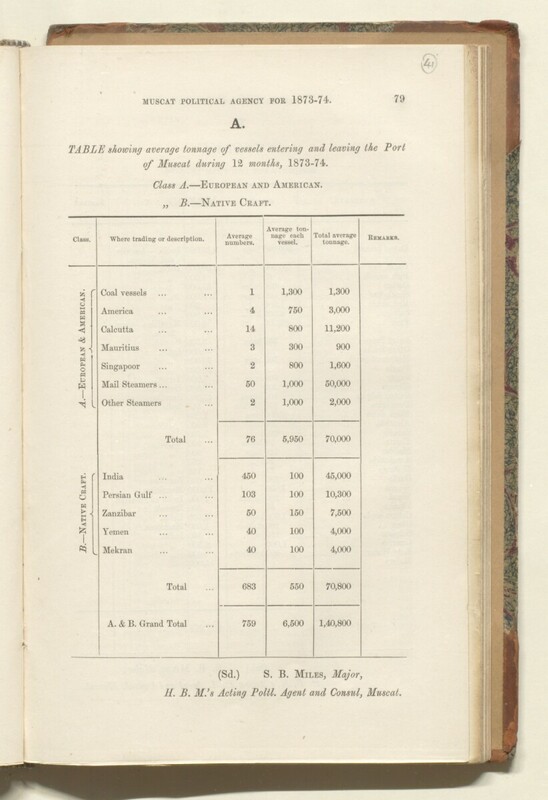 Six tables of trade statistics (A-F) (folios 41-46). The report is arranged in two sections: the first relating to the Bushire Residency A diplomatic office of the British Government established in the provinces and regions considered part of, or under the influence of, British India. , the second the Political Agency An office of the British Government and, earlier, of the East India Company. at Muscat.